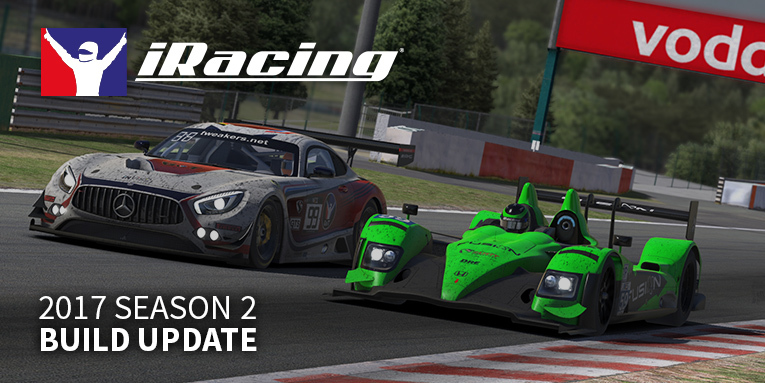 iRacing released the build notes a day before the deployment of the season 2 build. Unfortunately dirt racing is not a part of this build, but iRacing has stated they are close to releasing it. This build will have a lot of updates and improvements to the software. Last season we did not have any new content released at the time of the start of season 1. This season iRacing released The Bullring. A 3/8 mile oval next to the “big brother” Las Vegas Motor Speedway. Next highlight is the removal of the 32-bit version and DirectX 9 from the simulation. This also means Mac OS and Linux versions are not supported anymore as well. Three months ago iRacing implemented the first version of hand-over-hand driver animations. Now, iRacing has expanded these animations to 19 cars. Users of a virtual reality headset can now enjoy dynamic sounds based on the movement. A couple of weeks ago iRacing released the new Porsche 911 GT3 Cup car. This car has an updated tire model, which was very well received. Now it is possible to catch slides and the tires are not as very sensitive to overheating. The Porsche was a great preview on what’s to come. In the new build a lot of road car have received the same treatment as the Porsche. The cars should be more enjoyable to drive on -and over- the limit. Some cars also received sound updates, which is always great to have. Going into the season finale at Le Mans, we are happy to see the HPD, GT1, and GT3 cars all got these tire model updates. It should create a more enjoyable experience for the drivers. More control over the cars should create even better battles on the race track. The removal of the DirectX 9 version of the Sim will also now make the Sim incompatible with Wine software that allows the Sim to run on Mac OSX and Linux machines. However, you can continue to use your Mac computer to run the Sim using Apple’s Boot Camp utility and install a 64-bit version of Windows. A drop-down labeled “Safety Car” has been added to the “Optional Settings” section of the hosted session setup. The default selection is always “Default” which means the current safety car for the track type is used (Mustang for Ovals, Ruf RT 12R for Road). The available safety cars can change depending on the type of track selected. Chris Wheeler – Chris has been on the spotter stand for over 10 years and currently is the eye in the sky for Indycar racer Sebastien Bourdais. Darren Manning – Darren is an English racer who formerly raced Indycar for Chip Ganassi Racing. There is a UI option to enable/disable headset audio rotation. By default this setting is on, for headphone support. But if you use external speakers (such as a surround sound system) with your VR headset you should turn this setting off. Please also note that we are working on our next iteration of Optimized deployment, which will take into account the car’s position on the racetrack. – Toyota Camry only: The car body is still the 2016 version; the 2017 body style is a work in progress. – The Bullring at Las Vegas Motor Speedway is racing’s answer to truth in advertising. Located a stone’s throw away from the big 1.5 mile superspeedway that hosts NASCAR’s big three national touring championships each year, The Bullring is an asphalt oval that’s short on distance (3/8 of a mile) and long on action.